Carnegie Prize winner Melvin Burgess in conversation with SCBWI writer Lucy van Smit on writing The Lost Witch… and burn out. LUCY Dear Melvin, I didn't want to hurry you, I know you've been busy – but I never got an email back from you regarding the interview – I’m hoping it’s my fault and the emails bounced into the ether and I didn’t notice. Would you rather postpone till next year? LUCY Thanks, very kind of you to notice my debut. I was fascinated by something you said at YALC… that you feared you’d lost your mojo for writing YA… can you tell us what happened? LUCY My Chicken House editor, Rachel Leyshon wondered if your writing had changed with age? LUCY And then you knocked out the brilliant, The Lost Witch. How did you find your way back? Any tips for our SCBWI writers who’ve bashed the keyboard for years without getting through the publishing/agent ceiling? MELVIN Everyone needs a break from time to time. You need to keep other areas of your brain going, too. I know one writer who takes a course in something unrelated every year for that very purpose. That's a break of sorts. I did actually carry on writing - just not always books. I did books too – it was just that they were crap! So two approaches there. One is doing something different ... the other is just writing your way through it. Take your pick! I did both. LUCY In The Lost Witch, there are scenes that took my breath away, virtuoso scenes, the Hare scene being one, and the maternal retribution scene towards the end – do you know when you nail a scene or a piece of writing - or do you still squirm with uncertainty as a writer, no matter how successful you are? MELVIN I've never really squirmed with uncertainty. I write, I've always written, it’s like I can't help it. So if something is rubbish, I just have to move on. Writing is like magic – I can never believe it came out of me! I don't even feel all that responsible for it, very often. Those scenes you mention ... the first one in the car on the high moors, was the first thing I wrote of the book, and I wrote it a long time before the rest of the book. I developed it more when the idea was being developed with Lime Studios as an online graphic novel, and then again when it was becoming a book. I always loved it. My novels are usually structured around what I call key scenes – important scenes in which the characters are in action in circumstances that seem to sum up the novel, or on which the story hinges. In this case, it's all there – the Hunt, the parents not believing her, the witches, Bea's abilities. The conflict is set right there. Such scenes usually work, if the book is going to be any good. The maternal retribution came early as well. It was based on a recurring idea in folk tales that disobeying the spirit of your mother is dangerous ... a strange concept to us, but somehow, it rang true. LUCY You credit your editor, Charlie Shepard, hugely in this book – can you say how she helped you? MELVIN Basically, there are two sorts of books for me. There are the relatively short ones where you know what you're saying and where you’re going – they can be done quite quickly and without so much editorial help. Then there are the long ones, which are a real exploration of themes and ideas and characters – they're much harder. The Lost Witch was one of those. With that kind of book, which takes a long time and many re-writes, and before long, I get word-blind – I've been over it so many times I really need a good editor to point out to be what's working and what isn't. Charlie is great – she points out where there's an issue, makes a suggestion and then lets me solve it my own way. I always try to work with an editor. If they're good, that's great. If not, you have a problem. I had one editor who, when I said I was having problems with the first part of the book, told me not to worry – she'd sort that out. Hopeless! LUCY Any tips how to work with an editor? MELVIN Think of it as a collaboration. They're job is point out problems and make suggestions – yours is to find your own solutions to it. If you can do that, you're away. And be generous. In a very real sense, it's their book, too. LUCY Publication is a baffling process. A few writing friends have struggled with the process, the long hours, the low pay, the timid marketing, if you were a debut writer today, how would you grab the headlines and get people to champion your book? MELVIN God only knows the answer to that! I have no idea. There's so many factors involved. But always remember that it’s the ones who don't give in who get there. So my advice is – just don't stop! LUCY My editor believes that a good book will shine, eventually, even if the start is very slow. Do you think we should leave it to chance and the quality of the writing, as an author? MELVIN That's what I do. In the end it is the book that counts, not the PR, or the tweets, or the events. LUCY Finally, where are you now as a writer? If you haven't you said everything you want to say - what's next? How do you balance life and writing? MELVIN I've got some exciting projects coming up. There's always more to say, so long as you remain curious and engaged with the world around you – unless you strain your brain like I did! LUCY Great advice. Thank you! 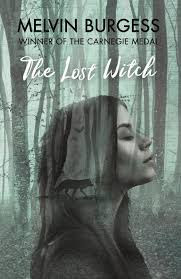 The Lost Witch by Melvin Burgess is out now with Anderson Press. Since doing this interview, The Lost Witch has been nominated for The Carnegie, and we wish Melvin Burgess every success. Lucy van Smit’s YA debut The Hurting is published by Chicken House Books.